Chicago, Nov. 21, 2018 — Inc. Magazine ranked Evolutyz Corp, a leader in the IT Products, Platforms, and Services company, as fastest-growing private companies on its 37th annual Inc. 5000, the most coveted ranking among the nation’s entrepreneurial elite – its fastest-growing private companies. Evolutyz Corp boasted a staggering three-year growth of 150%, over four times the average growth for other peer companies on the list. This is the third consecutive year that Evolutyz Corp has made the top tier, the Inc. 5000 list and was featured in the September issue of Inc., available on newsstands now. The list represents a unique look at the most successful companies within the American economy’s most dynamic segment—its independent small businesses. Microsoft, Dell, Domino’s Pizza, Pandora, Timberland, LinkedIn, Yelp, Zillow, and many other well-known names gained their first national exposure as honourees on the Inc. 5000. “It’s an incredible honor to be featured on the Inc. 500 list for three years in a row. Our growth is a testament to our amazing team that works incredibly hard to provide value to our customers with outstanding offerings. 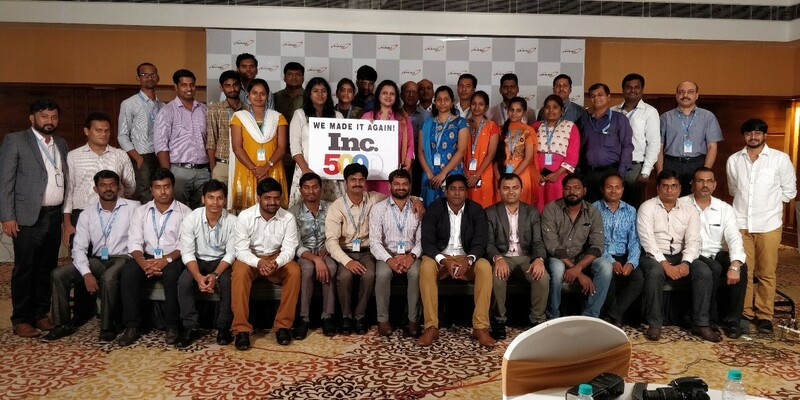 It’s such a motivating and rewarding, experience to build world’s leading IT Products and Platforms company” said Raghavendra Hunasgi, CMO of Evolutyz Corp. The 2018 Inc. 5000 is ranked according to percentage revenue growth when comparing 2014 and 2017. To qualify, companies must have been founded and generating revenue by March 31, 2014. They had to be U.S.-based, privately held, for profit, and independent—not subsidiaries or divisions of other companies as of December 31, 2017. (Since then, some companies on the list have gone public or been acquired.) The minimum revenue required for 2014 is $100,000; the minimum for 2017 is $2 million. As always, Inc. reserves the right to decline applicants for subjective reasons. Companies on the Inc. 500 are featured in Inc.’s September issue. For more, visit: http://www.inc.com/inc5000. Founded in 1979 and acquired in 2005 by Mansueto Ventures, Inc. is the only major brand dedicated exclusively to owners and managers of growing private companies, with the aim to deliver real solutions for today’s innovative company builders. For more information, visit http://www.inc.com.